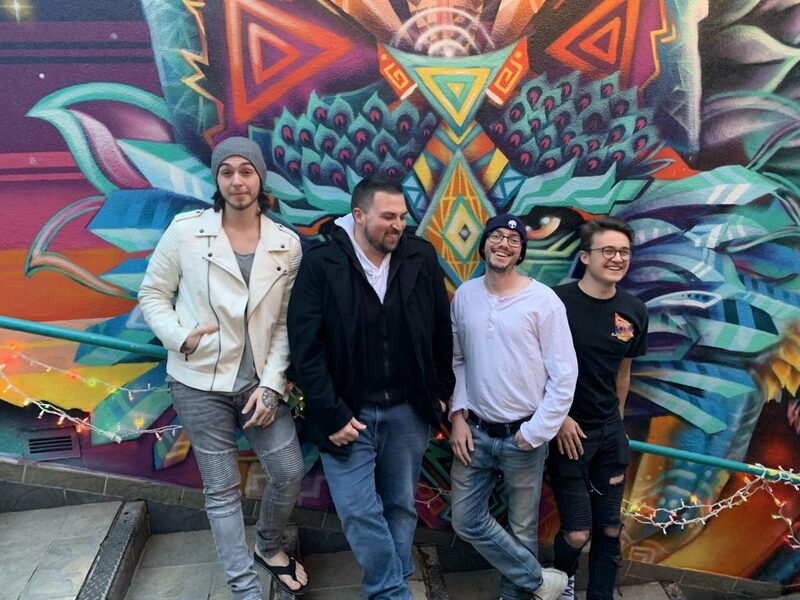 From left to right: Jake Reynolds, guitar and lead singer; Saunj Briancesco, bass and vocals; Marcus Newell, drums; Justin Reynolds, keys and upright bass. ALMA’s Battle of the Bands was such a fun event! With 5 bands and more than 125 attendees, Club 17 in St. Ives was the hopping place to be on March 30th. The prize for the winner is a paid Sundays at Six concert this summer on August 25th. The community saw performances from Landon Kreps, the Valley Cats, the High Vibes, the Locomotives, and Blue Sky. The bar was open and people were dancing and singing along whenever they could. In a very tight competition, the High Vibes won the crowd, with their set of all original songs. The Valley Cats came in a close second. The High Vibes came from Santa Fe, for their first performance out of New Mexico. A doubly young band in that they formed just eight months ago, and they range in age from 17 to 31. Their short time together as a group has not limited their productivity as they have over 20 original songs and will be releasing their first album “The Way It is” on April 26th. You can find The Way It is on spotify, itunes, and other digital platforms as soon as it’s released. They describe their music as psychedelic funk rock. They are always exploring new realms of sonic bliss with lyrical ideas that promote one love, peace and the expansion of consciousness. The band formed almost through happenstance with the two Reynolds cousins connecting one Christmas to discover the potential of playing together. Through random chance encounters and Craig’s List the rest of the group came together. Their lives outside the music illustrate the diversity the group has as Justin is still in high school, Marcus is a DNA analyst, Saunj works in clinical software development, and Jake refers to himself as a professional bum scraping together rent each month. Together, this group is aiming for music to become their careers. Be sure to attend their Sundays at Six Concert this summer on August 25th to hear more original songs as well as a dynamic display of musicianship across the board including instruments such as the ukulele and the upright bass. Don’t miss ALMA’s next concert, which will again be held at Club 17 in St. Ives and will feature Euforquestra, by popular demand. The concert will begin at 7:30 PM and tickets are $15 and free to ALMA members. There will be a meet and greet from 6:00-7:00 PM prior to the start of the concert where ALMA members will enjoy hors d’oeuvres and drinks as they socialize with the band. The meet and greet is free and is only available to members. You can become a member at the door. Remember this year all ALMA concerts are free to members. You can go to http://www.almaonline.org to become a member today! Come on out and vote for your favorite band. The victor takes the stage for Sundays at Six on August 25, 2019. 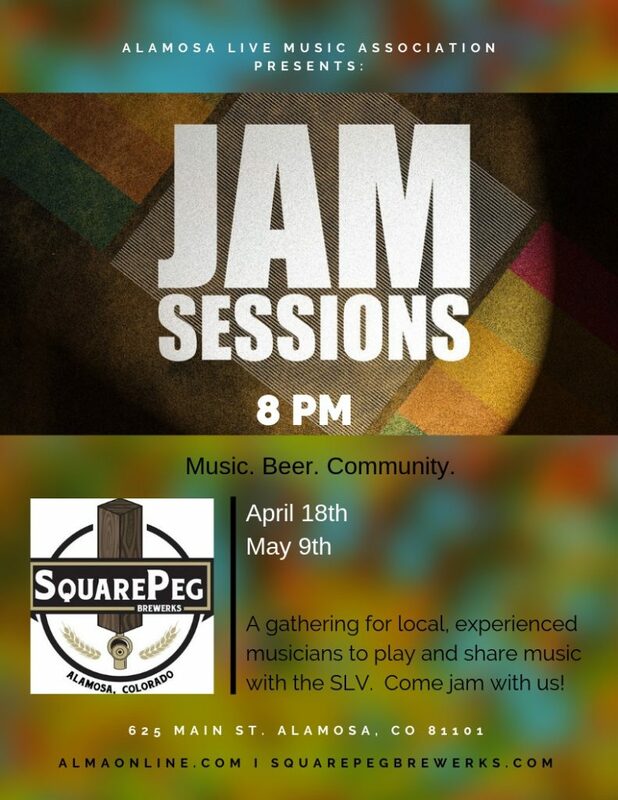 Come out and hear great local music while supporting ALMA’s work in bringing quality live music to Alamosa! 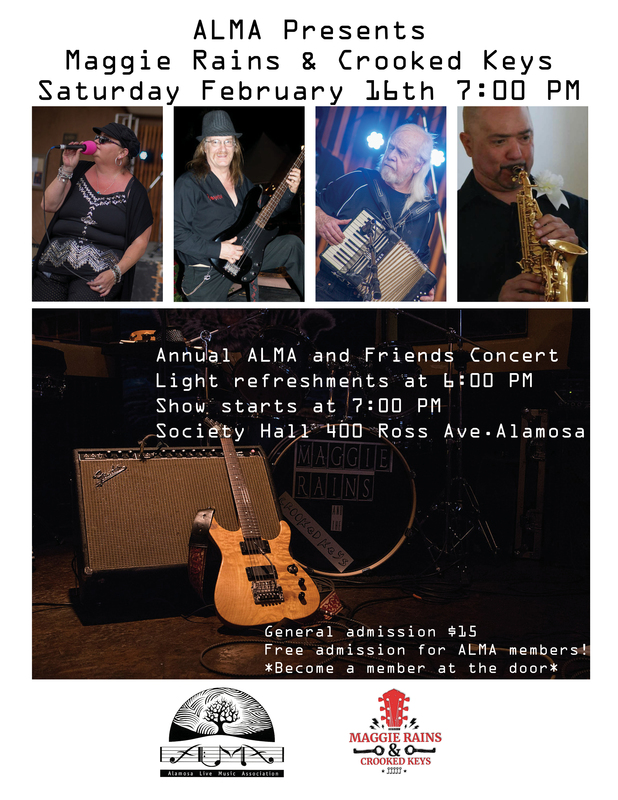 The annual ALMA and Friends concert is on Saturday, February 16 at 7:00 p.m. at Society Hall, 400 Ross Avenue, in Alamosa, CO. Doors open at 6:00 p.m. for light refreshments and a cash bar. Admission to ALMA & Friends is free for ALMA 2019 members and $15 for general admission. No advance tickets are for sale, so come early to grab a seat! We are pleased to announce that Maggie Rains & Crooked Keys is the performer for this year’s ALMA and Friends concert. Maggie Rains & Crooked Keys is a seven-piece, blues-rock cover band with a few originals that is based out of Southern Colorado, building quite a following there. Tracy J Reynolds, known professionally as Maggie Rains, is a native of Colorado and sings with a soulful deep and rich sound. She is an accomplished vocalist who brings to life a new blend of blues, jazz and rock to make the components of her new EP Anathallo shine for her audience. Every year, musicians contribute their talents for an ALMA membership drive concert. ALMA memberships help to make the Sundays at Six concert series in Cole Park a free service to all and help to fund ALMA’s regular programming and other live music events throughout the Valley. 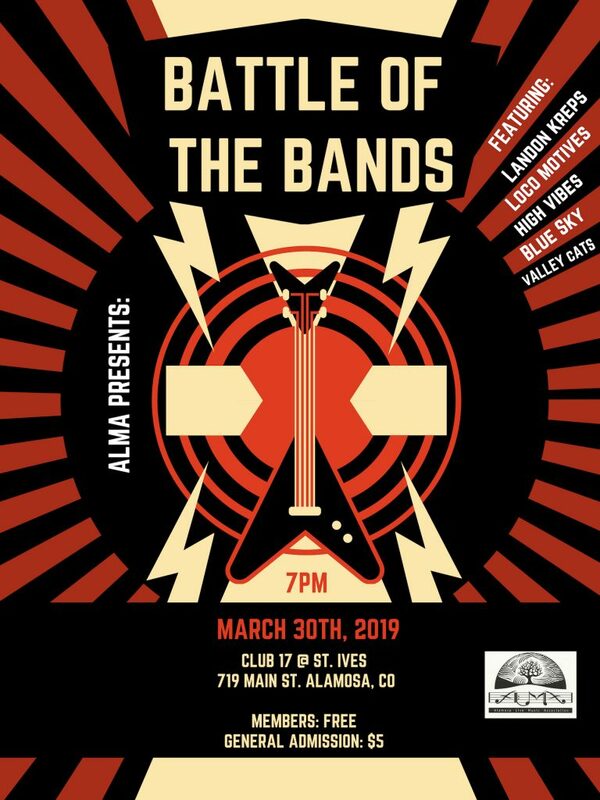 ALMA is very proud to be celebrating 20 years of live music in the San Luis Valley. Our birthday gift to our 2019 members is free admission to all ticketed 2019 ALMA concerts. 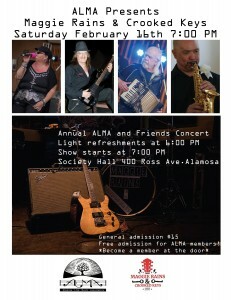 ALMA & Friends is the first of a number of concerts this year that will be free of charge to all ALMA members. Other concerts include, but are not limited to: Battle of the Bands on March 30, Euforquestra on May 4 and The Vogts Sisters on September 28. Sundays at Six concerts are, as always, free and open to the public.